The haiku in this image previously appeared in Blithe Spirit 17:1. David, thanks for noting that — I'd somehow forgotten to include the prior publication note when I published this. I've added it to the main part of the post now too. Thanks Dylan – I didn't want to annoy anyone at the British Haiku Society. I couldn't get my comments to work, either, so I may have posted twice. Thanks for publishing – good to see it on your site. I have been enjoying the other work. Brightly lit reminder of the fragile hold we have on existence, the season fraught with loss as well as gifts of life, a surprising and stunning image, and a bold one. I like the haiku and the image works well too. 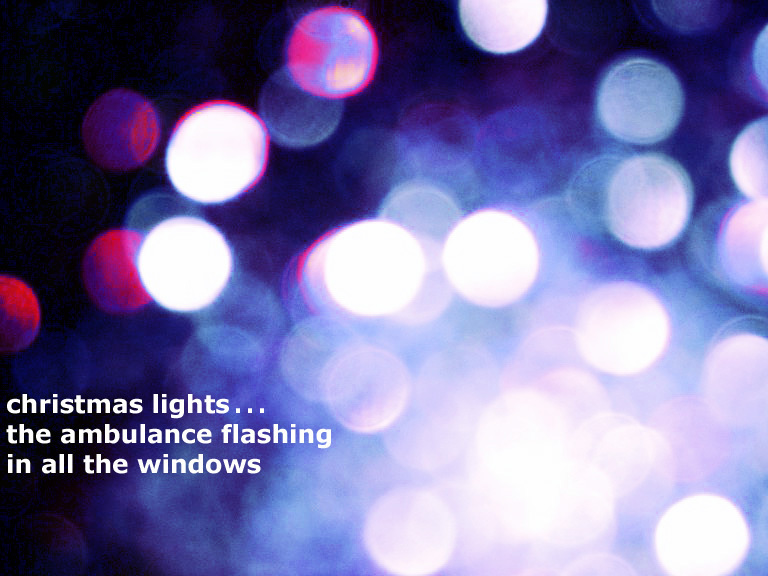 Christmas has been the season of emergency services lights and alarums.